Long gone are the days when eGo style e-cigarettes were at the top of the food chain in the vaping world and cigalikes ruled with an iron fist. Today it’s all about advanced personal vaporizers packed full of features that allow users to customize their vaping experience to the extreme. Keeping up with consumer demand is vital in a fast-evolving industry, and Apollo E-Cigs is one of the few long-established e-cigarette companies that has actually been successful at it. They recently released the 4th version of their popular VTube regulated mod, a high-quality vaporizer that promises excellent performance and a not-so-steep learning curve. The VTube v4 is a variable wattage mod, but there are plenty of those choose from. What makes it special, apart from the cylindrical shape – which is actually a breath of fresh air from all the popular box mods – is its sub-ohm vaping capability. Most regulated mods won’t fire when paired with atomizers with a resistance of under one ohm, but the VTube is compatible with sub-ohm attys down to 0.2 ohms. Taking into consideration the VTube’s 50-watt maximum power output and it’s safe to say this thing can chug vapor like crazy. Granted, high wattage vaporizers have become the norm in recent months, and the maximum output limit is being pushed virtually every day, but for beginners and intermediate vapers looking to get started with a sub-ohming device, they are not viable choices. Most companies only sell the mods themselves, leaving the users the choice to pair them with the tanks/RDA’s and batteries they prefer. For inexperienced users that can be a very confusing and even potentially dangerous affair. Luckily, the VTube is a much more accessible solution. Advanced users who already have a collection of tanks and RDA’s can purchase just the Apollo Vtube mod ($79.95), while vapers looking for a ready-to-vape package can opt for the complete VTube kit ($139.95), which, value-wise, is simply unbeatable on the market right now. You get the VTube variable-wattage mod, a proprietary Apollo Phazer sub-ohm tank, an 18650 Panasonic battery, a Trustfire dual 18650 battery charger, a stylish carry case and a 30 ml bottle of either Fa-Q or Lindbergh MAX VG e-liquid, both of which we reviewed and can vouch for. For $139.95, you’re going to have a hard time finding better value anywhere else. Looking at the VTube v4 mod, it’s clear to see it was designed with simplicity and practicality in mind. 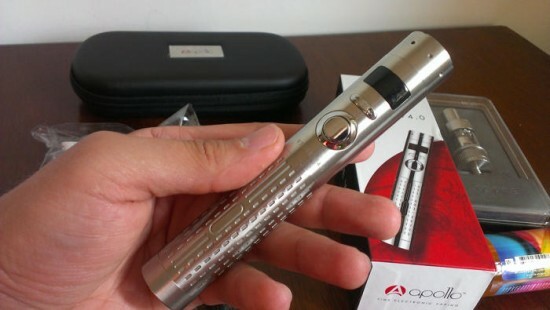 It’s a two piece design – the bottom part is a detachable battery tube that fits flat-cap 18650 batteries perfectly. 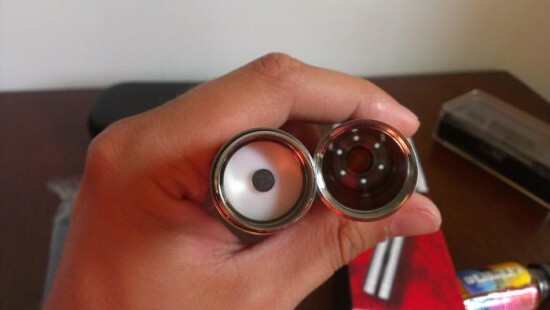 Normal batteries fit too, but the tube doesn’t screw on all the way, so you’re going to see some of the threading exposed either at the top of the tube, or at the bottom, where it connects to the vented battery cap. It’s not a deal breaker, but it’s a flaw that could have easily been avoided. The top part of the VTube features a standard 510 connection with a spring-loaded pin that can accommodate any type of atomizer, an LED display and a three-button control panel. You have your large firing button sitting flush on the mod and two smaller wattage adjustment buttons. Press the “+” button and the wattage increases in 0.1 watts increments. Hold it down and it goes up at a faster speed. Press the “-” button and the wattage goes down. As soon as you insert the battery and screw VTube back together, the LED display lights up. You can see the atomizer resistance, battery level, current wattage and wattage as well as the puff counter that lets you keep track of your daily vaping habits. If you don’t have an atomizer connected, the resistance and voltage levels are going to be “0” and pressing the firing button will prompt the message “Check Atomizer”. 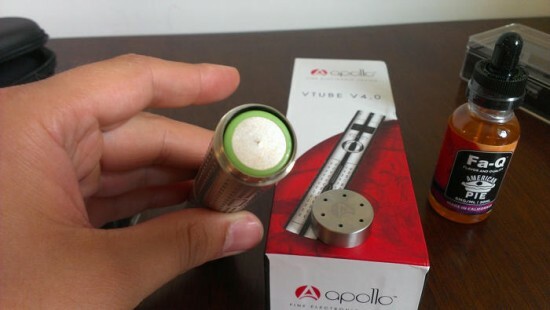 Once you connect the atomizer, the VTube will check the resistance as soon as you press the firing button and display the information so you can make adjustments to the wattage accordingly. As with any advanced vaporizer, you need to have a basic understanding of Ohm’s Law to use the VTube safely and efficiently. Apollo does include a handy “vaping power chart” that indicates what wattage you should be vaping at for various coil resistance values, but it only goes down to 1.2 ohms. For sub-ohm vaping, you’re going to have to do your own research. It’s not exactly rocket science, but you do HAVE TO educate yourself about this stuff. Luckily, the VTube is a regulated mod with a couple of useful built-in protection features – short circuit protection and low voltage protection. If the device detects a short it won’t fire. The same happens when your battery voltage falls under the safety limit, prompting you to recharge it. 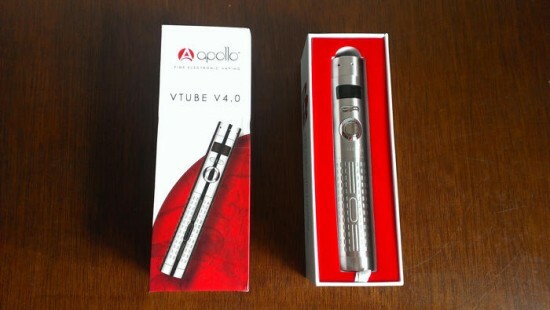 Apollo sent me the VTube for review a while ago, and it came with an Aspire Atlantis sub-ohm tank, one of the most popular in the vaping community. They have since then introduced their own proprietary tank, the Phazer, which comes with 0.2Ω or 0.5Ω atomizer coils, depending on your preference. The Atlantis came with 0.5Ω coils, which was fortunate, since 0.2Ω is a bit too low for my comfort. I know a lot of vaping enthusiasts regularly vape at 0.1Ω resistance, claiming it’s totally safe if you know what you’re doing, but that’s just too extreme for me. Anyway, I set the VTube to about 25 watts and the Atlantis performed beautifully. It really brought out the flavor of those delicious Fa-Q juices and delivered thick clouds of warm vapor. Though I haven’t tried it first hand, the Apollo Phazer looks like a quality tank as well. But you don’t have to use the included tank, the VTube works perfectly with RDA’s as well. I tried it with some of my favorite rebuildables – Plum Veil and Dark Horse – with 0.5Ω coils, and the flavor I got from my e-liquids was slightly better than with the Atlantis. It is a slightly messier, more labour-intensive affair for casual vapers, but if you like tinkering with vaping gear, there’s nothing like a low-resistance RDA on a 50 watt vaporizer. There’s no point talking about battery life with mods like the VTube, since it all depends on the wattage your using it on. At 25 watts, I got a full day of moderate-to-heavy vaping out of the Panasonic 18650 included in the kit, but vaping at the maximum 50 watts will probably drain it much faster. If you’re using regular resistance atomizers (e.g. 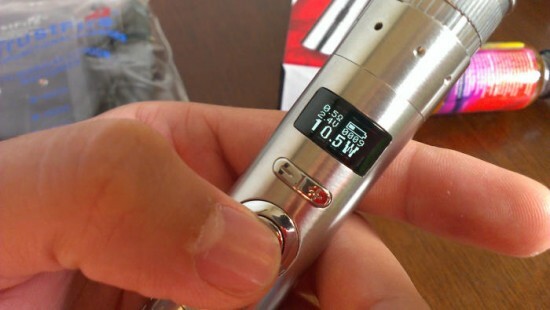 1.5Ω, 1.8Ω) the battery will probably keep you vaping for two days, at about 10 watts. The VTube is definitely one of the most solid mods I’ve ever used, but its main draw, I think, lies in the simplicity of use. You’ve only got three buttons to work with, and it’s very easy to figure out what to do with them, all you need to figure out is the watts-ohms ratio, which is also simplified by the voltage value shown on the LED display. Otherwise, you just put in a battery, screw the VTube back together and you’re ready to vape. And yes, this is a 50 watt mod that you can use for advanced stuff like sub-ohming, but you don’t have to, if you don’t feel prepared. You can just use it at lower wattages with standard resistance clearomizers and tanks. 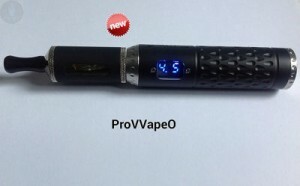 I have been using Apollo E-Cigs products for years now, starting with the original Apollo Standard Kit and then moving on to the Superior eGo Kit, both of which have since been discontinued in favor of newer and better vaping devices, and clearly the VTube is a major step in the right direction. As I mentioned at the beginning of this review, they are one of the few e-cig companies that have stepped up their game to keep up with the fast-evolving vaping technology. Most of the other big names still have cigalikes and eGo-style e-cigs as their main offerings. If you’re in the market for an advanced regulated mod that can handle sub-ohming down to 0.2Ω, and want to get the best value for your dollar, the Apollo VTube is an ideal choice. 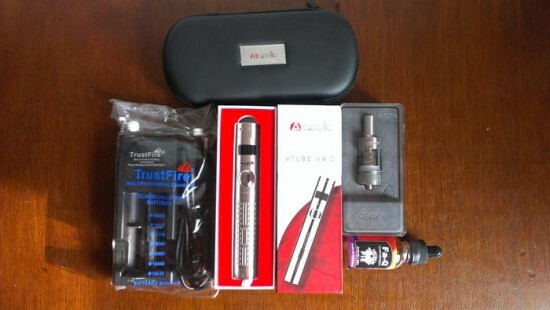 The kit contains more than enough gear to justify the $139.95 price tag, plus the Apollo name is a guarantee for quality. Two thumbs up for the VTube! 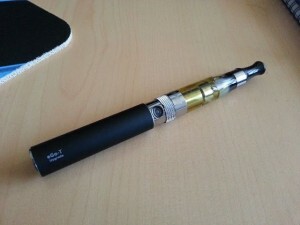 What Is an E-Cigarette Mod? 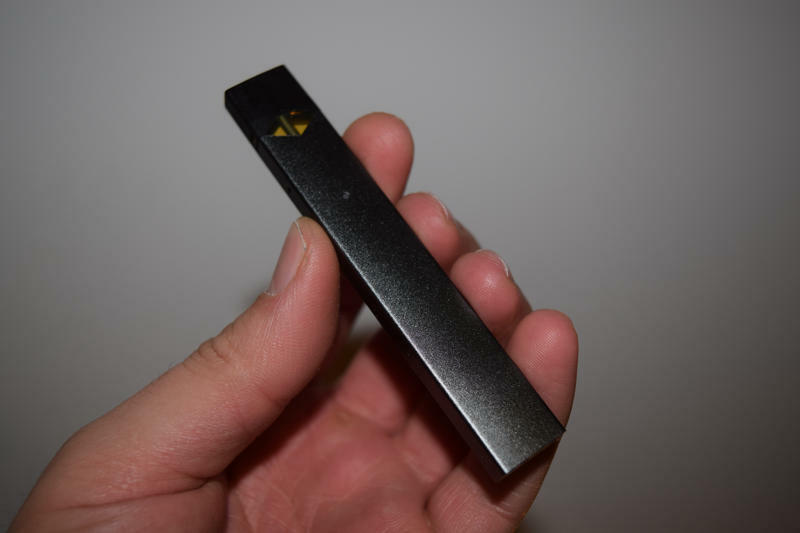 What Is an eGo E-Cigarette?